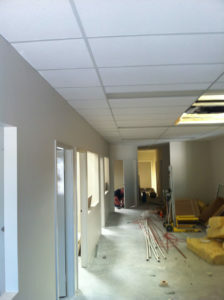 Our team are great for your commercial ceiling repair. Assisting you to choose acoustic and thermal barriers, with moisture and impact protection. At A1 Performance Ceilings we ensure the very best quality materials are used on your ceiling repair. We guarantee to provide you with the highest quality commercial ceiling repair work available in Perth. Our clients’ satisfaction is that which we consider to be most significant, and a lot of our jobs are from happy customers recommendations or repeat work from there own commercial ceiling repair. All our plasterers are completely qualified and licensed to perform any of our jobs to the highest standards available in the industry. A typical repair process would begin with a phone call, Your phone call. A time date and location will be made and A estimator will come and give you a quote on the price and a period of time for the job to be done. witch will be emailed through, at witch point you will then have the option to work with us and have a professional easy repair process begun. we will then arrive at the time agreed to do the work anything needing to be covered with drop sheets will be materials will be delivered and installed where needed the job is left clean and tidy ready for hand over often involving vacuum and a mop up. Whether your Commercial build entails stud wall repairs or new builds, some doors that need to be hung or anything in between. we have the skills and the know how to get your job done right. We would be happy to provide a quote based on a set of plans, or we can meet onsite to discuss the details of the job. We very often work with builders providing shop fit-outs, warehouse additions, repairs and maintenance. So you can rest assured that any commercial fit-out needed we can even help you. With have years of experience in the commercial industry and utilising professional trades people for all of our work we ensure the job is done right!